I just turned 62, but feel 42 and, according to my kids, act like I'm 12. I have a great job, perhaps the best job in the world. I'm an economics professor and get to teach, consult, write, advise governments, and run my personal finance software company. Each of these "jobs" is more fun than the next. For me retirement, as in no longer doing these jobs, would be work. I'd have to work very hard to find things to do that are as entertaining. I realize I'm extraordinarily lucky. Simply being employed is a big deal these days. Being healthy enough to work late in life is another huge gift. And, the icing of doing something you love, well, it's on the cake. How long do I intend to "work"? Hopefully, right up to my last day. And, as if I didn't have enough good reasons to work, Social Security offers me a significant incentive for doing so. The longer I work, the larger will be my Social Security benefits. This is due to Social Security's Recomputation of Benefits provision. Each year you work, you add to your earnings record leading Social Security to automatically recalculate your benefits. The gory details are here. In a nutshell, Social Security averages your highest 35 years of earnings to figure your Average Indexed Monthly Earnings or AIME. Then it plugs your AIME into a formula that figures out your full retirement benefit, called your Primary Insurance Amount (PIA). What benefits you can get for yourself and your spouse (including your ex spouse(s) and children, if they are young enough or are disabled) is all hooked to your PIA. Social Security considers all your covered earnings from age 16 on and indexes, based on historic wage growth, all earnings through the year you are age 60. Earnings after age 60 are just treated at face value. So if you are now, say, 65, are still working, and you started work at 16, you have 45 years of indexed earnings and 4 years of non-indexed earnings. Social Security then takes the 35 largest of these values to compute your AIME. If your current earnings are above the smallest of the 35 (ignoring this year's earnings) being used to form the AIME, bingo! You'll raise your AIME, which will raise your PIA, which will raise your Social Security check (checks, if your dependents are also collecting). Is this a big deal? Well, I just looked at my own situation using my company's software. I didn't really start contributing much to Social Security until I was 29. I was in grad school before then and on a postdoc after grad school. If I were to stop working today and wait until 70 to collect benefits -- when they would start at their highest value, my lifetime benefits would be $774,210. (Lifetime benefits are calculated as the present value of benefits through age 100 discounted at a 3 percent rate above inflation.) If I were to work until age 70, my lifetime benefits rise by $80,312 to $854,522. If I work till 80, they rise another $88,154 to $942,676. Hold on! There's another kicker, namely spousal benefits. Let's suppose I were married to someone my age who had never worked. In this case, her lifetime spousal benefits would rise from $345,586 to $413,570 were I to work until 80. So in addition to picking up $168,466 for myself by working through age 80, I pick up $67,984 for my spouse. In my case, working through 70 will kick out all the low earnings ages out of my top 35. But what I found remarkable, until I thought about it, was that working from 70 to 80 would generate an even larger increase in lifetime benefits. 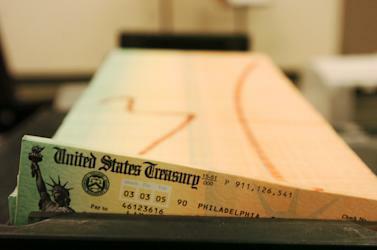 The reason is that I'm above Social Security's covered earnings ceiling, which was $106,800 in 2011, when I turned 60. Last year the ceiling was $110,100, and this year it is $113,700. Extrapolating this roughly 3 percent annual growth rate, the covered earnings ceiling when I'm 79 will be close to $200,000! Since all my earnings will be above the covered ceiling and since all future covered earnings ceilings will exceed $106,800, each year I work will lead to a replacement of a lower earnings year in my AIME formula with a higher one. Since the adjustment of the covered earnings ceiling depends on nominal wage growth, if inflation takes off or if real wages grow even more rapidly, the covered earnings ceiling will grow at an even faster pace. And the fact that his nominal (face value) covered earnings is being compared with my earnings up through 60, albeit indexed by wage growth through age 60, means that I and everyone else in my boat that earns above the ceiling can benefit, potentially big time, from working very late in life. I realize this is complex, but the essence of what's going on is that the AIME formula doesn't properly adjust for inflation and this failure to do so leads to an Social Security benefit advantage to people like me when it comes to continuing to work. But even people earning below the ceiling are likely to benefit, especially if their current earnings are relatively high and grow relatively rapidly in the future. The bottom line? If work is fun or at least not awful, keep at it. Retirement can be awfully dull, and there is no guarantee that the grim reaper will make it on time. And for those who can keep working, know that Social Security may make it well worth your while. Laurence Kotlikoff is an economist at Boston University and President of Economic Security Planning, Inc. whose company markets Maximize My Social Security and ESPlanner.